Khổ qua ("bitter melon" in English) is a truly unique vegetable. 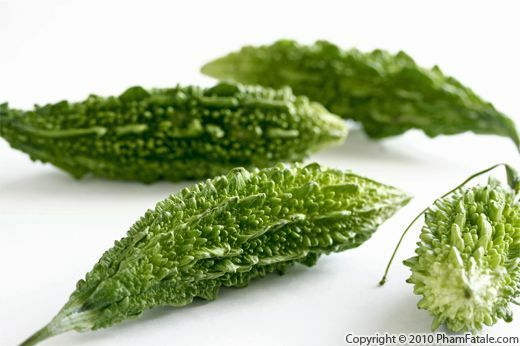 Its warty, pale-green color could scare even a veteran foodie away. However, it’s actually a very forgiving and versatile veggie! 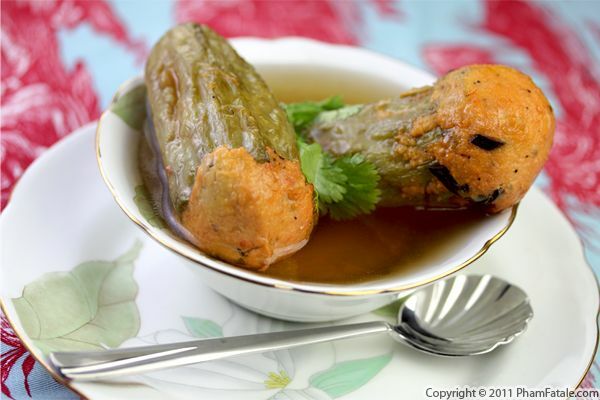 In Vietnamese cuisine, it's often served with pork or shrimp; I filled it with soybean stuffing instead to imitate the meat and served the bitter melons in canh (Vietnamese broth). I love this dish because it's so flavorful and the texture of the soybeans is dense and very similar to meat. I also flavored the filling with fresh wood ear mushrooms for a more meaty texture. If you're trying this dish for the first time, I have to warn you that bitter melon, as its name indicates is, well, bitter. But really, you have to try it at least once. It's a love-it or hate-it kind of vegetable, but who knows, my might get struck by Cupid's arrow! Bitter melon (also known as bitter cucumber, bitter gourd or karela) is an acquired taste. That's a polite way of saying a lot of people dislike it. As the name implies, it is bitter, but when cooked properly, it can make a delicious dish. I learned this particular recipe from my husband Lulu's auntie. Sherin Auntie made achar using Indian bittermelons. What is achar you ask? Achar is to Indian cuisine what nuoc mam is to Vietnamese food. It's a popular, oil-packed Indian pickled condiment. We usually eat it with kichdi (Indian lentil rice) and raita (Indian yogurt condiment). First, Sherin Auntie seeded the karela and cut them into small shreds. She decided to par-boil them so they'd be tender but this step is optional. She then fried them with Indian spices until it formed a chunky, thick paste and completed the process by sealing the mixture in a jar. 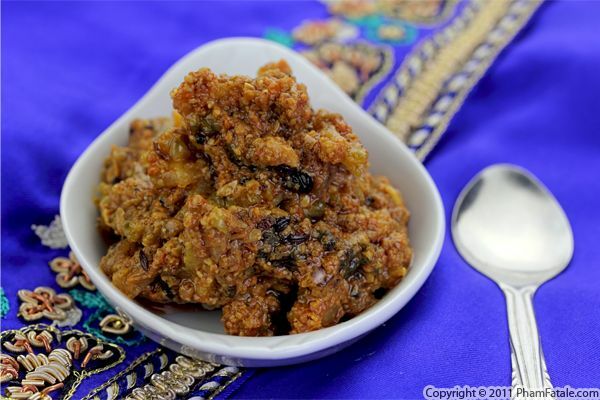 The last bit of this recipe is time; you have to let the achar stand for a few days so the ingredients infuse and develop into a flavorful condiment. But I promise you it's so addictive, you'll keep asking for more rice so you can eat more achar. Today’s giveaway is 4 bags each of Mary’s Gone Crackers 3 pretzel stick flavors.They come in Sea Salt, Chipotle Tomato and Curry. I got a chance to try the curry flavored “sticks & twigs” recently, and I can tell you they go really great with Cypress Grove Chevre. My father-in-law almost ate the entire pack along with the cheese, so I was lucky to get the few bites I did before they disappeared. The pretzels are earthy and the curry flavor really comes through. For a chance to win the pretzels, just enter today’s giveaway. Make sure you're a fan of PhamFatale Facebook fan page and Mary's Gone Crackers, or follow @Phamfatalecom and tweet about this giveaway. To make it easy, you can just copy and paste this tweet if you’d like: "Mary's Gone Crackers #Giveaway from @Phamfatalecom and @GoneCrackers: http://bit.ly/sp4V7y". Several months ago, I shared a bitter melon recipe (called karela in Urdu) that Baji (my husband's paternal grandmother) used to make very often for the vegetarians in the family. Unlike the Vietnamese variety (known as bitter cucumber), Indian bitter melons have a spiky outer layer. Shana from North Carolina (a regular reader) asked me a very good question. "What does karela look like?" I looked back at the published recipe and realized I hadn't taken a picture of the raw product. Better late than never, here's how the odd-shaped vegetable looks. So next time you visit an Indian grocery store, you might want to grab a few, deep-fry them and stuff them with meat or lentils. Bitter melon is an acquired taste but give it a try. You may love it! Bitter melon (also known as bitter cucumber, bitter gourd or karela) is an acquired taste. That's a polite way of saying a lot of people dislike it. As the name reminds you, it is bitter, but when cooked properly, it can be a delicious side dish. It is also very nutritious. One of bitter melon’s many properties is that it's supposed to lower your blood sugar, so it’s worth working it into your diet. I've posted several Asian-style bitter melon recipes, but today I cooked it the way my father-in-law likes it. Compared to the Asian variety, Indian bitter melon (or karela) is much smaller and darker, and is covered with spikes. 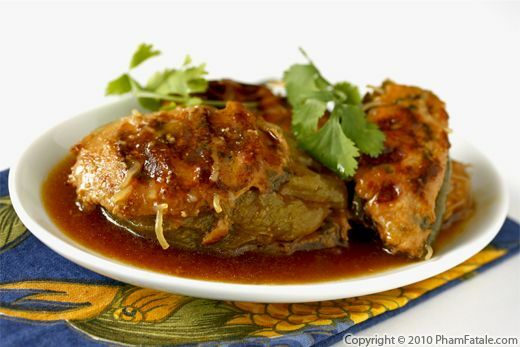 For this recipe, the karela is cut into chunks, fried and stuffed with chana dal. The fried rings of bitter melon are then simmered in masala tomato sauce. Fried onions and amchur, or dried mango powder, cut the bitterness and balance the flavors. You’ll still know you’re eating bitter melon, but you just might like it! Khổ qua nhưn tàu hũ, tofu stuffed bitter melon is similar to dishes you might have seen at Chinese or Vietnamese restaurants. The difference is that it's usually shrimp paste instead of tofu (tàu hũ) and eggplant or button mushrooms in place of the bittermelon, called cà tím nhưn tôm ("eggplants with shrimp paste" in Vietnamese). I made my own blend of ground tofu paste with fried tofu and vegetarian ham to resemble the color of shrimp paste. I then stuffed the mixture into the bittermelon rounds and steamed the vegetables. For more flavor, I pan-fried the tofu filling then braised the dumplings in sweet pineapple hoisin sauce. I love this dish because it's so flavorful and the texture of the tofu is very similar to meat. My husband Lulu, who’s a vegetarian, really likes it even though he isn’t into meat substitutes. It just proves that there’s more to vegetarian and vegan cooking than just silken and firm tofu! Page 2 of 2 pages.